A sensational necklace full of treasures. 11 centre-drilled diamond Moroccan copal amber beads which were worn in the hair, with 9 silver etched pendant drops. 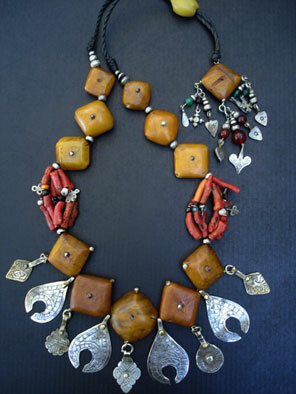 Old Mauritania coral with small Saharhwi silver and trade beads and some ebony beads embedded with silver. This amazing necklace is finished with a strong braided waxed cord that allows the length to be adjusted. The end piece that hangs down the back of the neck is in itself a work of art with an amber bead and various silver beads, mixed silver dangles and trade beads. Necklace length adjustable up to 30"